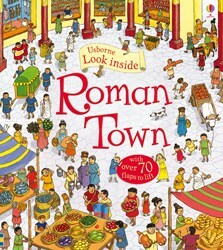 Travel back in time and look inside the fascinating daily life of the Ancient Romans in this busy lift-the-flap book. Join the Flavius family as they go shopping, visit the baths and watch a thrilling chariot race. Over 70 flaps reveal rich details of interiors and the inner workings of a Roman town. A brilliant first information book. Featuring Look Inside Roman town.